McKenney -Waa-Pa-Shaw. A Sioux Chief. McKenney, Thomas Loraine and James Hall. - Waa-Pa-Shaw. A Sioux Chief. Waa-Pa-Shaw. A Sioux Chief. - McKenney, Thomas Loraine and James Hall. Title : Waa-Pa-Shaw. A Sioux Chief..
Map maker : McKenney, Thomas Loraine and James Hall.. 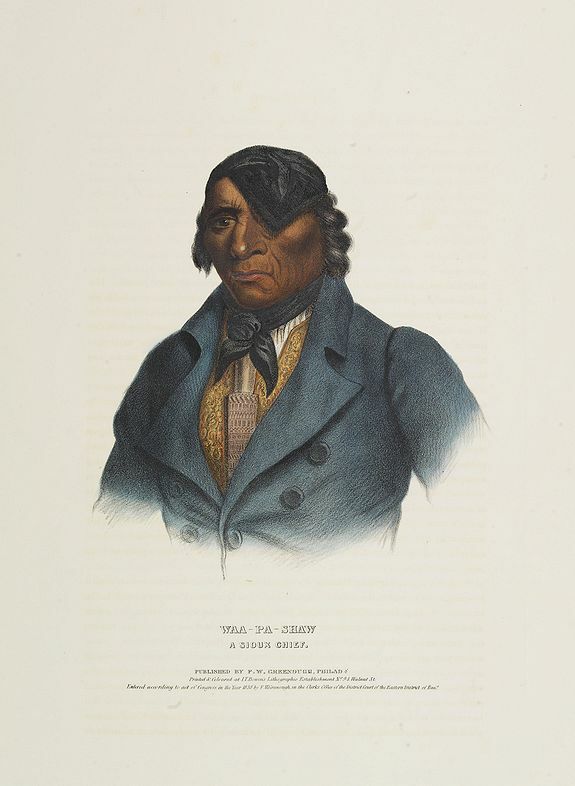 Description :A beautifully defined lithograph of a half-length portrait of Waa-Pa-Shaw, better known as Wabasha, he was chief of a Kiowa tribe of the Mdewakanton Sioux. He was treated with great respect by all the Sioux. He recommended non-resistance to the whites, though he and his people were removed twice to new settlements. He was described by General Whiting in 1820 as a small man with an eye patch, "but who walked about with the air of an ancient king." (Horan). He was the first Native signer of the Prairie de Chien Treaty, indicating his importance among the assembled chiefs. Disbound from McKenney & Hall's History of the Indian Tribes, perhaps the most important work ever published on North American Indians. Published by F.W.Greenough, Philadelphia and printed on the original full folio sheet.